The vote of UCU members in the recent e-ballot paused our industrial action campaign to facilitate the formation of the Joint Expert Panel (JEP) into the USS valuation. But the JEP is already facing resistance from USS itself. Even before the JEP has been elected, its independence, its ability to question the valuation and its authority to decide changes are being undermined by the actions of USS. If the JEP is unable to affect the valuation this round, members will see escalating costs or cuts in their pensions, or both. The USS Joint Negotiating Committee meets on the 27th April. If the JEP is to function effectively it has to be empowered to properly investigate the valuation, challenge assumptions and explore alternative valuation methodologies. We reserve our right to take further action. If this means putting industrial action back on for the examinations period and beginning a new industrial action ballot, so be it. USS management are fighting a rearguard action to defend their valuation methodology, despite it having been discredited by members, by First Actuarial and UCU, by individual employers and even by UUK itself. Our industrial action has destroyed the credibility of the valuation, revealing it as partisan, inconsistent and designed to undermine the viability of a Defined Benefit pension scheme. When we are told that a valuation fluctuates from a £5.2 to £7.5 billion deficit (before settling on £6.1 billion), most unbiased observers would see it as anything but definitive! USS is being obstructive because it is no longer a body set up and run by members and employers. Instead has become a giant pension fund with its own interests. USS, and more precisely its senior managers, are placing their own credibility in the financial sector above those of the members of the scheme who stand to lose their pensions. They want to minimise risks to themselves (whether actual or perceived) and maximise their profits. USS’s latest decision to impose cost-sharing increases in contributions, under rule 76.4, of 10.6% on members and employers (3.7% on members and 6.9% on employers), seems designed to make the continuation of the Defined Benefit scheme unaffordable to all. If this were not bad enough, USS are saying that the JEP would have to report by the end of the summer and can only make minor changes to assumptions. This rule 76.4 imposition seems aimed at undermining the JEP, however independent or expert its members. USS are now seeking to manage their campaign in defence of the valuation, referred to as the November valuation, and in doing so provide partial, inaccurate and biased information. So in their latest video, A technical overview of the 2017 Valuation, https://vimeo.com/264204534 a series of incomplete and inaccurate statements are made to encourage a view that their valuation remains justified. We are told at the very beginning that the ‘Trustees must make decisions in the best interests of the beneficiaries of the scheme’ (0.28 minutes in). This implies that members’ interests are paramount. Yet this is an incomplete and misleading statement. USS’s legal advice to the JNC was that the law ‘.. does not require that every decision taken by USSL or the JNC should have an exclusively positive impact on the financial wellbeing of each member… Decisions have to be taken in the round, taking account of uncertainty over time and considering the Scheme as a whole (US legal advice to JNC members 22ndJanuary 2018). It is the ‘scheme’ not the ‘member’ which takes paramount importance in decision making. Loses of pension by members is acceptable as long as the scheme is maintained. Elsewhere in the video there are numerous other examples. So we are told (12:30 minutes into the video) that USS is at “the least prudent end” of UK pension schemes for its valuation, yet this is a comparison with DB pension schemes which are closed to new members. It compares the open collective USS scheme, with its collective covenant agreement covering all pre-92 HE institutions, with closed schemes backed by only individual employers? Why wouldn’t USS be less prudent than these schemes in these circumstance? We are also told (19:00 minutes) that each element of the variables within the modelling for the scheme are “independently verified”. Yet there is no consistency in the data used for these variables. Salary growth, for instance, is measured in different ways with a lower measure for the growth of assets (salary growth = CPI) and a higher measure for the growth of liabilities (salary growth = CPI +2%). This is what is meant by bias. Most importantly the discount rate is designed to demonstrate a deficit. As USS are forced to admit (25:00 minutes into the video) the 10 year rate of return on equities is estimated at CPI + 1.91%. Yet USS arbitrarily chose a discount rate of CPI – 0.53% for their 10 year discount rate, even though they know a discount rate of just CPI +1.35% is sufficient to break even. This is setting up the valuation to generate a deficit and is what UCU calls ‘reckless prudence’! The imposition of rule 76.4 means that USS have made it clear they are committed to sticking to the November valuation, irrespective of the JEP. They say they will defend their valuation by imposing increased costs on employers and employees if the JEP seeks to make any significant changes – which it would have to do if it were to undertake a serious approach to the valuation methodology, assumptions or accounting standards. Where does that leave the union? 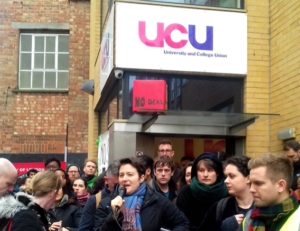 Firstly, UCU must continue to demand UUK support the decision to establish the JEP and ensure it has sufficient authority and time to examine the scheme’s methodology in full. UCU must insist that the DC scheme is formally withdrawn at that meeting. The USS proposal to impose rule 76.4 must also be rejected by the JNC. The April 2019 implementation date for changes to benefits and contributions must be abandoned. There is no reason to retain the original deadfline from a discredited valuation process. A new implementation date can be determined once the JEP has reported. Until such time maintaining our existing DB scheme with the status quo and no detriment ‘at least’ until April 2019 must now be agreed. If the employers will not support this position at the JNC, it indicates that they are not genuine in their proposal for a joint expert panel in the 23 March UUK offer. It will be a slap in the face for every member of UCU, including those who voted YES for the offer. UCU needs to be clear with its members. We have demonstrated our industrial leverage, and we must be prepared to use it again. 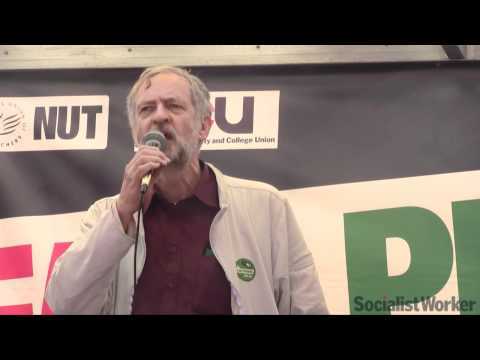 Members have learned that by carrying out extended strikes we can completely disrupt and shut down the college. Our current mandate continues until 19 July. UCU can strike with 14 days’ notice for any period until then, and can start a fresh ballot mandate for further action, including to hit the beginning of the autumn term if necessary. Following the JNC, UCU must urgently call branch delegate meetings, this time with full voting rights, to debate the way forward and to discuss mobilising branches for future action. Most of all, what is happening must be discussed with members face-to-face. Branches will need to call general meetings and put Late Motions to Sector Conference in May as part of the campaign for renewed action to defend USS.